The logo for the Ecuadorian Ministry of Culture website is about my favourite thing of the afternoon which is saying a lot since I spent much of the day reading about giant Olmec heads. Three Valdivia Figurines in the colours of the Ecuadorian flag? I am sold! Golly, I love Valdivia figurines for all the right and all the wrong reasons. There are two things that can easily be said about Valdivia figurines: they are VERY Ecuadorian and they are VERY looted. The first explains why they appear prominently on the Ministry of Culture website (and on stencilled graffiti around Quito circa 2007). Ancient Ecuador has played second fiddle to Ancient Peru since the early days of archaeology. The Valdivia culture, however, represents something that Peru doesn’t have, ‘the oldest’. Everyone loves ‘the oldest’, national pride, etc. etc. Who else loves ‘the oldest’? Collectors and Museums. If the Valdivia pottery sequence is the oldest in the new world, collectors want a slice of that pie. Heck, even better than some junky pottery, the Valdivia made interesting figurines: lovely ladies that look good on stark black backgrounds in auction catalogues. They are part of ‘the oldest’ yet they also look good. 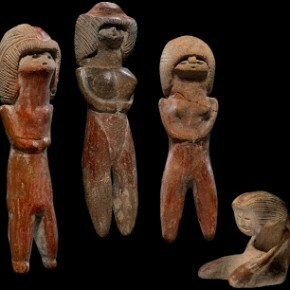 Valdivia sites are famously looted and Valdivia figurines are famously faked. A few years back I started doing some initial work into looting in Ecuador (which led to fieldwork in Quito and the cloud forest that didn’t really go anywhere as of yet) and I, like anyone else going down that road, came across Bruhns and Hammond’s 1983 Journal of Field Archaeology piece ‘A Visit to Valdivia’. Knowing nothing at all about Ecuador at the time, I had never heard of Valdivia, a wonder since the only Ecuadorian archaeology books that Cambridge owns are a few by the late Betty Meggars and Emilio Estrada from the 1950s and 1960s which link uber-ancient Ecuador to Jomon Period Japan (yeah…I know). As Bruhns and Hammond relate, Meggars detected faking at Valdivia immediately after the start of her excavations: practical jokers who discovered a market for their copies. As the market for the pieces grew, the presumed fakes get more and more elaborate and fanciful…and Valdivia sites were just looted to pieces. So really with Valdivia we are left with a situation where we don’t know what is real. It is directly comparable to the Cycladic Figurine problem: the corpus is mostly looted, it contains tons of forms not found in the limited archaeological excavations that have been conducted, and we intellectual consumers of artefacts don’t know what to believe. To me Valdivia figurines are the perfect looting Catch 22: they warrant study so that the interested public can learn about ‘the oldest’, but they can’t be studied because collectors wanted ‘the oldest’ so sites were looted and buckets of fakes were produced. In 2007 I bought a fake Valdivia figurine in Otavalo which now stands in a Spondylus shell on my counter and watches me cook. The fella selling it to me told me it was real. I knew it wasn’t but made to put it back saying something along the lines that law breaking makes me sick. He quickly agreed that it wasn’t real and cut his asking price by a ton. Que Sera. 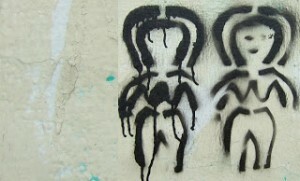 Three cheers, Ecuadorian Ministry of Culture, your logo is the best. To read a bit more about Valdivia figurines, check out this Encyclopedia entry on the Trafficking Culture website.